There are 17 other images of this object. This object has no known copyright, and as such we offer a high-resolution image of it. See our image rights statement. See more objects with the tag collectors, architecture, borders, classical, designers, print collectors, garlands, publication, King of Poland, ironwork, script, text, Duke of Lorrain, ornamentation, frame. See more objects with the color silver rosybrown dimgrey darkslategrey or see all the colors for this object. This object is the first item in a set that contains 23 objects. This is a Bound Volume. It is dated ca. 1763 and we acquired it in 1921. Its medium is etching on heavy cream laid paper. It is a part of the Drawings, Prints, and Graphic Design department. 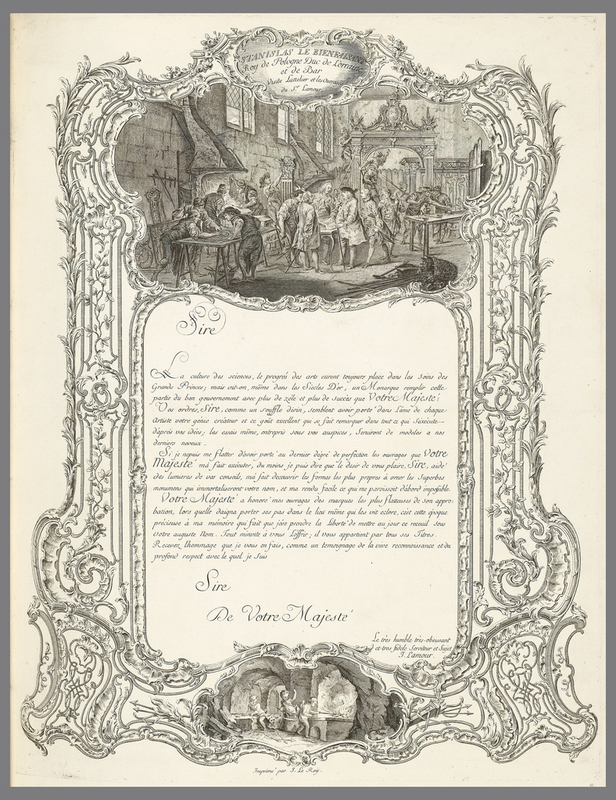 An elaborate frame surrounds the title and the dedication page of an ornamental publication by Jean Lamour (1698-1771), a French ironmonger, blacksmith and master metalworker native to Nancy. This etching is the frontispiece for Recueil des ouvrages en serrurerie (1767), dedicated to Stanislav I Leszczyński, the King of Poland (reg 1704–9), and the Duke of Lorrain and Bar. The design displays a gate topped by flower-filled urns with Stanislav’s coat of arms at the apex of the arch. Mounted on the columns are trophies of war composed of Roman cuirasses, spears, and classical helmets. 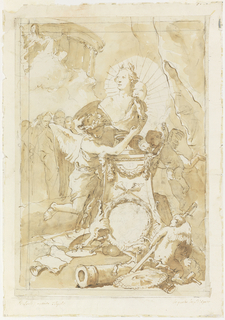 Below is an allegory of drawing and design as a putto holds up a drawing featuring a scrolling ornament in the style of Lamour while another putti sketches after it. Jean Lamour is known for his wrought-iron gates and railings for Place Stanislas and Hôtel de Ville (city hall) in Nancy. 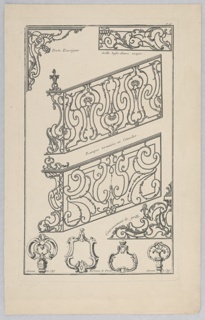 Lamour reveled in the high rococo style, which was characterized by c- and s- curves, sinuous forms inspired by nature, and a profusion of escutcheons. 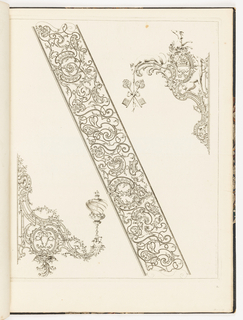 His Recueil was an album of engravings featuring metalwork designs he had made for Stanislav. Such ornamental pattern books were marketed toward fellow artisans and helped the evolution and the dissemination of rococo style across the provinces of France and the European continent.